I wear skull accessories year-round, but pumpkin jewelry is strictly reserved for autumn. Why remind myself during other seasons that there's no pumpkin cheesecake to be found on dessert menus? I can be scary if the food I'm craving isn't available. 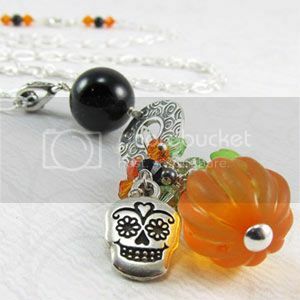 Beaded Embellishments' crystal cluster necklace combines a sugar skull charm and pumpkin bead into a Halloween treat. The drop cluster sparkles with various shapes and sizes of black Swarovski pearls and orange, black and green Swarovski crystals that have been wire wrapped with sterling silver wire and attached to a silver-plated chain. A 14mm black onyx round bead is wire wrapped and attached to an antique silver-plated swirl link. The cluster is suspended on a 28" silver-plated textured oval chain with a silver-plated bail. The Halloween necklace fastens with a sterling silver lobster claw clasp, embellished by orange and black Swarovski beads on each side. 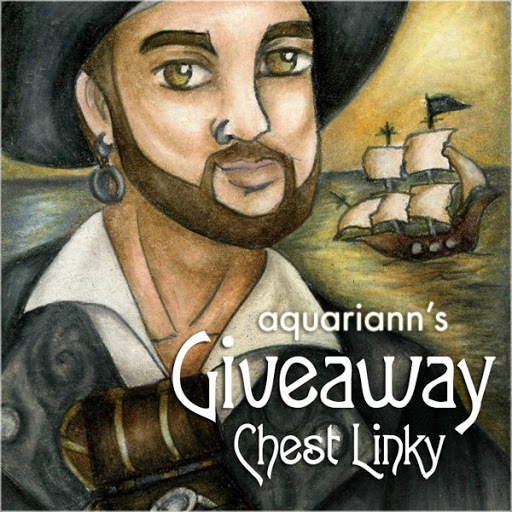 Disclaimer: The handmade necklace above received the most clicks during my 2013 Halloween Shop Hop and won this free blog post feature. How cute. Sugar skulls are so much fun.